VetRide Kilcunda 2017 Bass Coast Beach and Bike starts Thursday 2nd March 2017 a and ends Monday 6th March 2017 – the ride will be based in Kilcunda and utilise the Bass Coast Hills and Rail Trail. The Kilcunda Oceanview Holiday Resort is located on the beachfront, with the Kilcunda Pub and Cafe / General Store across the road. The Resort has a Recreation Centre and communal kitchen, BBQs and dining areas, adjacent to which is a large concreted area suitable for our VetRide service and bike trailers. There are any amount of things to see and do in the Bass Coast Region and on nearby Phillip Island http://visitbasscoast.com.au/. The small community of Kilcunda is situated on the pristine and rugged South Gippsland coastline between Phillip Island and Wonthaggi. The hotel, a general store and cafe are situated on the Bass Highway and across the road is a coastal reserve perched above the beach, consisting of a caravan park, BBQ shelter and picnic areas, all offering scenic views towards the ocean. There are three distinct beach areas in Kilcunda. The main town beach across the road from the shops and below the caravan park consists of wide stretches of sand with steep cliff backdrops and rocky platforms with shallow rock pools that extend into the sea. Shelley Beach is a secluded sandy beach bounded by two rocky headlands, accessed from either the Bass Highway west of Kilcunda Ridge Road or by walking around the western headland from the main beach. Past the eastern headland at the main beach is the town’s surf beach, popular with anglers and surfers. Here, the rocky cliffs give way to a backdrop of large sand dunes and wide expanses of sand. One of Kilcunda’s best kept secrets is the Powlett River, accessed from the Mouth Of Powlett Road, 3 kilometres east of town on the Bass Highway. Fishermen frequent the area around the river crossing and also further along the river where it swells into what resembles a large lake. Safe, sheltered swimming and boating can be enjoyed in the river’s shallow waters as it approaches the ocean at the Kilcunda-Harmers Haven Coastal Reserve. Sand dunes rise high above the river mouth, offering scenic views back along the river and of the wind-swept ocean beach. The Bass Coast Rail Trail follows the route of the former railway line which connected Nyora with the coal mine at Wonthaggi. One of the best known features along this walking and cycling track is the railway trestle bridge over Bourne Creek which was built in 1910 and offers a spectacular vantage point, providing views of the surf beach below and to the hilly inland grazing areas. Another scenic track is the 7 kilometre long George Bass Coastal Walk which offers panoramic coastal views from a narrow winding path as it follows the coastline from the end of Punch Bowl Road in San Remo to the Kilcunda foreshore. A drive several kilometres northwards along the unsealed Kilcunda Ridge Road takes visitors into the surrounding rolling hills where picturesque views of the coast from surrounding grazing land can be enjoyed. The area is also home to the Bass Coast Cycle Challenge, that takes place 0n 12 November and given its suitability, VetRide will be conducting its road rides in the same area. A lovely place to have breakfast, morning tea, lunch or afternoon tea. The cafe is located opposite some spectacular coastline. The best place to eat is at the outdoor tables but you can sit inside if its windy. 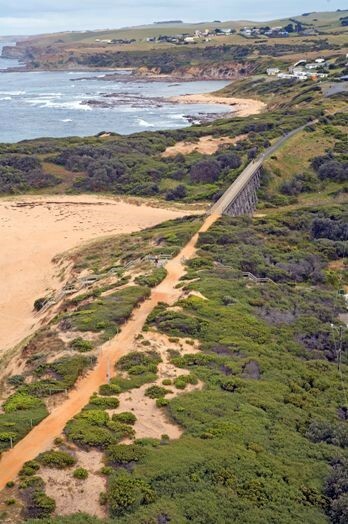 We are home to one of Victoria’s coastal rail trails which offers panoramic views of Bass Strait from the Bourne Creek Trestle Bridge at Kilcunda. 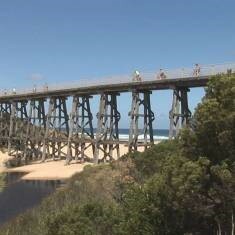 The Trail meanders through farmland, coastal bushland, historic coal mining reserves and rugged coastline. The Bass Coast Rail Trail links to the George Bass Coastal Walk at Kilcunda, so it is possible to walk from the Punch Bowl in San Remo all the way to the centre of Wonthaggi. The Trail starts at the old Wonthaggi Railway Station in Murray Street or at the old Anderson railway station site on Bass Highway at the roundabout to Phillip Island. An extension of the trail from Anderson to Woolamai is suitable for walkers and horse riders only. If you are bringing a large organised group along the Trail you should ring us before organising the event to make sure that the Trail is available and is not being used for another organised event. Contact our Arts and Leisure Team on 1300 BCOAST (226 278). More information and maps are available on the Rail Trail’s Website, in our Bass Coast Rail Trail Brochure (1.4MB) or by contacting our Arts and Leisure team on 1300 BCOAST (226 278). Wonthaggi is the closest and better option for the nexus of the road cycling stages, as the Bass Coast hinterland’s undulating hills have quiet roads. It is 13.7 k from Kilcunda to Wonthaggi / 26.9 k from Kilcunda to Cowes. The Bass Coast Cycle Challenge conducts a number of road rides in the area, no doubt because they are minor roads, but with some amount of undulations to keep things interesting. I have plotted some of these on the map below and in due course our Ride Director, Steve Masters will be providing you with our suggested rides for the event, over a range of distances and difficulties.